Selling power from an electric vehicle’s battery back to the power grid has been touted for years as one of the future advantages for this new class of cars. But the reality is much more complicated. There are issues at the levels of the carmaker, utility and grid operator that would have to be resolved to make that transaction not only possible, but also financially attractive. That will likely change as the regulatory and technical kinks are worked out. To prepare for the future, NRG Energy announced on Monday it is forming a company with the University of Delaware called eV2g, to commercialize the technology that will allow electric vehicle owners to sell back to the grid. “As more electric vehicles hit the road and charging stations -- such as those provided by NRG’’s eVgo network in Texas -- continue to proliferate, EV-to-grid technology is the next logical step in the electrification of our transportation network,” said Denise Wilson, President of NRG’s Alternative Energy Services. For now, there is no firm pilot scheduled -- and there are no commercially available EVs that can do what eV2g envisions. The technology will initially be tested with fleet vehicles. Although it’s still early days, Wilson said that more than 90 percent of EV drivers in the Dallas area had signed up with NRG Energy’s eVgo subscription charging network and the next step is to provide these drivers with ways to get more out of their car. For a utility or ISO to get value out of an EV battery, it needs a whole group, rather than just one sole participant, which is why fleets seem like the natural starting point for testing. In the early stages, coordinating with just one person who manages the fleet is also easier than herding 50 individual drivers. In the U.S., none of the EVs on the market have the technology to sell power off of the battery back on to the grid, although many carmakers are expected to have that feature around 2012 or 2013, according to Willett Kempton, a professor at the University of Delaware who has developed V2G technology. In other countries, like Japan, the technology will be available as soon as this year, according to The New York Times. If it all sounds very familiar, it is. 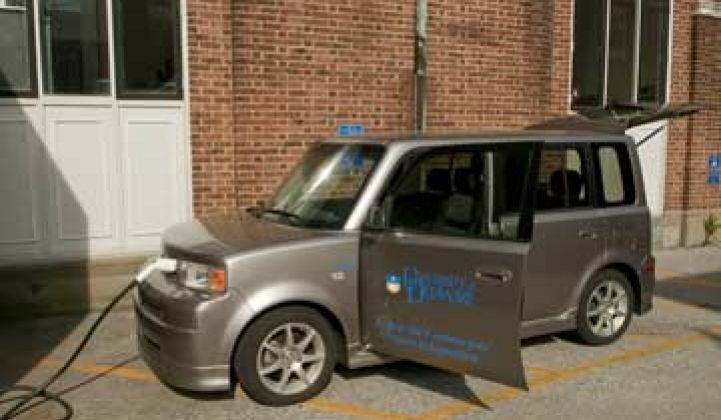 Nuuve, a company also spun out of University of Delaware and testing in Denmark, is piloting about 30 cars to sell power back to the grid. Nuvve’s server is the arbiter between the EV batteries and the power market through the system operator. In fact, Nuuve is the international version of eV2g. They are both commercializations of the same technology from Kempton and his team at Delaware. Individual carmakers, like Nissan, are also developing systems to control the power flow back to the grid. When EVs were first coming on the market, some experts speculated that charging and draining the car to sell power back to the grid would slash the battery life, and carmakers would possibly negate battery warranties for consumers who signed up for V2G programs. But Kempton is confident that his team’s patented technology allows for power flows that won’t affect the lifespan of the battery. “We’d like to see some controls on the car and some on the charger, and then most of the work is done at a central system,” he said. Even if the carmakers are on board, there is an issue of financial compensation. The regulatory structure currently doesn’t allow individual consumers to play in wholesale markets using their car batteries. But grid operators are “wildly enthusiastic” about this technology, Kempton said, and so it is likely that regional and federal regulatory bodies will work out pricing schemes in coming years. NRG Energy and the University of Delaware know that it is early days and the first step will be to identify fleets that want to take part in the pilots. Wilson said they hope to have that announcement by the end of the year. “We will get proof of concept done and then take it to the next level,” said Kempton. Apparently, having a cash-back car in your garage is still a while away.